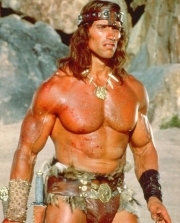 Conan is the son of Corin , chief of a barbarian tribe. The youth is a skilled but violent warrior, whom his father believes is not ready to wield his own sword. One day, their village is attacked by the forces of Khalar Zym , a warlord that is reuniting the pieces of the Mask of Acheron in order to revive his dead wife and conquer Hyborea. Thousands of years ago, the Mask, crafted by a group of sorcerers and used to subjugate the world, was broken into many pieces, which were scattered among the barbarian tribes. After locating Corin's piece and murdering the entire village, Zym leaves. Conan is the only survivor, and swears revenge. Years later, Conan is a pirate still seeking revenge. In the city of Messantia, Conan meets Ela-Shan (Saïd Taghmaoui), a thief being chased by a man whom Conan recognizes as Lucius (Steven O'Donnell), one of Zym's soldiers from years before. He allows himself to be captured alongside Ela-Shan. Conan escapes imprisonment and confronts Lucius, forcing him to reveal that Zym seeks the pure blood descendant of the sorcerers of Acheron; sacrificing the descendant will unleash the mask's power. He helps the rest of the prisoners to escape, and, in gratitude, Ela-Shan tells Conan that, if he ever needs him, Conan will find him at the City of Thieves, Argalon. Meanwhile, Zym and his daughter, the sorceress Marique attack a monastery where they believe the pure blood is. Sensing something is wrong, Fassir , an elderly monk, tells one of his students, Tamara , to run away and return to her birthplace. Tamara's carriage is chased by Zym's men, but Conan rescues her, and also captures one of Zym's men, Remo . After forcing him to reveal Tamara's importance as the pure blood, Conan catapults Remo into Zym's nearby camp. Zym and Marique confront Conan, who is pretending to be interested in exchanging Tamara for gold. 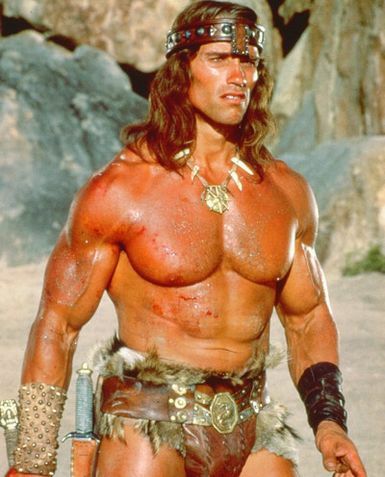 Conan attacks Zym, but Marique saves her father by invoking soldiers made of sand and then poisoning Conan with a poison-laced boomerang sword. Tamara rescues him and they return to Conan's ship, stationed nearby, where his friend Artus helps Conan recover. The boat is attacked by Zym's men, and, although they kill several of Conan's men, they are defeated. Conan orders Artus to return to Messantia with Tamara and departs to confront Zym in his kingdom. Artus tells Tamara that Conan left a map behind and she follows him, meeting with him in a cave, where they make love. The next day, as she is returning to the boat, Zym's men and daughter capture her. Conan learns of Tamara's capture and departs to Argalon, where he asks Ela-Shan to help him break into Zym's castle unnoticed. Zym prepares to drain Tamara of her blood to unleash the mask's energies. After confronting several monsters that guard the dungeons, Conan infiltrates Zym's followers and watches as Zym puts on the empowered mask. Conan releases Tamara, and she escapes as he battles Zym with the castle falling around them. Marique attacks Tamara, but Conan hears Tamara's scream and defeats Marique, cutting off her hand. Tamara kicks her into a pit, where she is impaled by a large spike below. Zym comes and, finding his daughter's corpse, he swears revenge upon Conan. Conan and Tamara become trapped on a unstable bridge as Zym attacks them. He uses the mask's power to call forth the spirit of his dead wife, Maliva, a powerful sorceress who was executed by the monks from Tamara's monastery for attempting to unleash occult forces to destroy Hyborea, and Maliva's spirit begins to possess Tamara. She begs Conan to let her fall, but he refuses, and instead stabs the bridge before jumping to safety with Tamara. The bridge collapses along with Zym. The power-hungry ruler falls to the lava below the immense precipice screaming the name of his wife, implying his demise. Conan and Tamara escape, and he returns her to her birthplace, telling her that they'll meet again. He then returns to his old village and tells his father that he had avenged his death and recovered the sword Zym stole from him, honoring his memory. Whole or part of the information contained in this card come from the Wikipedia article "Conan Barbarul (film din 2011)", licensed under CC-BY-SA full list of contributors here.